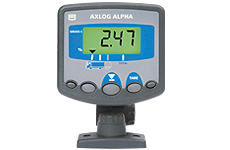 The RDS Axlog Alpha is a user-friendly vehicle overload warning system that provides individual axle overload information to the operator and the gross total. Enables correct loading of vehicles. Avoid overload penalties and prosecution. Reduces mechanical wear and tear on the vehicle, reducing servicing costs and prolonging the vehicle’s life expectancy. Can be used on a wide variety of applications including trucks, vans and refuse vehicles. Individual gross axle weight display and overload alarm (for up to 4 axles). Audible alarm output at 90% and 100% of GVW. ’Load Light Bar’ output option at 50%, 75%, 90%, 100% and 110% of maximum weight. Weight displayed as net or percentage of GVW.